The best day to close on a new home is the day after Christmas according to a new ATTOM Data Solutions market analysis of more than 18 million single-family home and condo sales over the last five years. 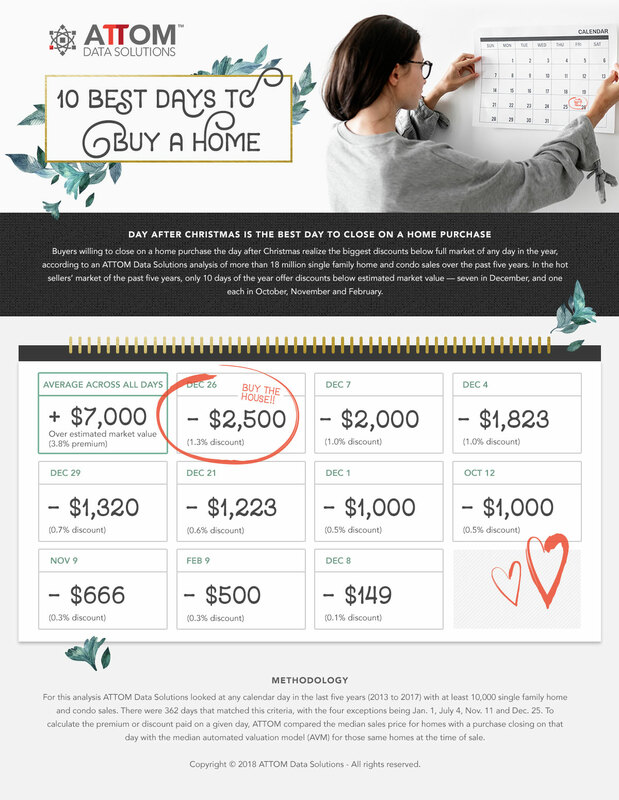 Why is December 26 the best day to buy a home? It’s the day where buyers see the biggest discount below full market value! On average, buyers see a 1.3% discount on the purchase of their new home when they close on December 26, or $2,500 below the estimated market value of the median priced home. To determine the list, ATTOM Data Solutions looked at any calendar day in the last five years (2013 to 2017) with at least 10,000 single-family home and condo sales. There were 362 days that matched this criteria, with the four exceptions being January 1, July 4, November 11 and December 25. To calculate the premium or discount paid on a given day, ATTOM compared the median sales price for homes with a purchase closing on that day with the median automated valuation model (AVM) for those same homes at the time of sale. ATTOM’s analysis shows that only 10 days of the year offer discounts below estimated market value – seven in December, and one each in October, November and February. This is evidence of the hot seller’s market we’ve seen throughout the last five years. December is the best month to buy nationally, and the State of Georgia is on par with the national average, as December is also the best month to buy a new home in the Peach State. The median discount buyers receive when they close in December in Georgia is 5.3%! The next best months are November and October, which both have a median discount of 4.5%, followed by January with a 3.6% discount and September with a 3.2% discount. Locally, in metro Atlanta, November is actually the best month to close on a home, with the median discount received at 5.2%. December buyers receive a median 4.7% discount, while January buyers receive a median discount of 4.5%, followed by February and October, which both have a median discount of 4%. What does this mean for metro Atlanta home buyers? You still have time to start your home search to get one of the year’s best deals. And, with many builders offering end-of-the-year incentives, especially on inventory homes, you may even be able to ring in the New Year in your new home in Atlanta!